Cut the wings off the chickens. Place on a cutting board and quarter them neatly. Prick the chicken all over with fork or a thin skewer. Make diagonal slashes, + inch deep, 1 inch apart on the meat. Add meat tenderizer and lemon juice to the chicken, and rub them into the slashes and all over for 2 minutes. Put all the ingredients of the marinade into the container of an electric blender or food processor, blend until reduced to a smooth sauce. Pour this marinade over the chicken pieces and mix, turning and tossing, to coat all the pieces well. Cover and marinate for 4 hours at room temperature, or refrigerate overnight, turning several times. Chicken should not remain in the marinade for more than 2 days, because the marinade contains a meat tenderizer which, with prolonged marinating,alters the texture of the chicken meat to very soft and doughy. 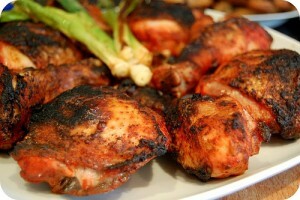 Take the chicken from the refrigerator at least 1 hour before cooking to bring it to room temperature. The chicken is now ready to be either roasted in the oven or broiled over an electric or charcoal grill. Start heating the oven to 500-550 degrees. Take the chickens out of the marinade. Brush them with the ghee or vegetable oil, and place them on an extralarge shallow roasting pan, preferably on a wire rack. Set the pan in the middle level of the oven, and roast for 25 to 30 minutes, or until the meat is cooked through. There is no need to baste while the chicken pieces are roasting, because the enclosed environment keeps the chickens from drying excessively. Preheat the broiler. Brush the grill with a little oil to prevent the meat's sticking. Place the chicken pieces, slashed side up, on the grill, and brush the slashed side with ghee or vegetable oil. Cook 2 to 3 inches away from the heat for 20 minutes. Turn and cook the other side for another 10 minutes, or until the chicken pieces are cooked through. Brush often with ghee or vegetable oil during cooking.